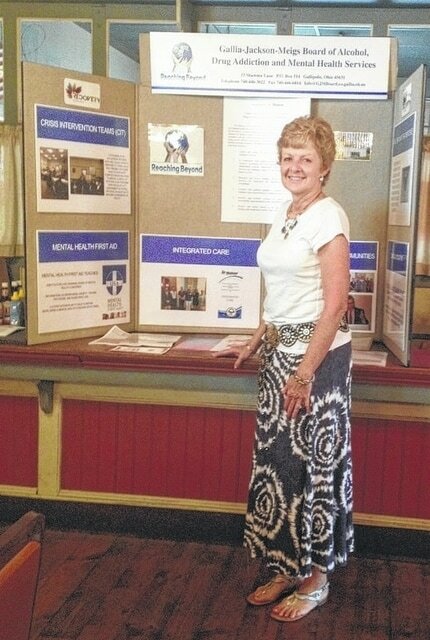 Robin Harris presents information on Gallia-Jackson-Meigs Board of Alchol, Drug Addiction and Mental Health Services. POMEROY — Robin Harris is passionate about her work. The deputy director of Gallia-Jackson-Meigs-Board of Alcohol, Drug Addiction and Mental Health Services spoke Tuesday to Meigs County Chamber of Commerce members about raising awareness and solving problems the area faces in terms of drug addiction. Also in attendance at the chamber’s monthly luncheon in Pomeroy were representatives of Sen. Rob Portman and U.S. Congressman Bill Johnson. “Opiates are driving almost everything we are doing,” Harris said. She shared a statement by someone who asked her what the community could do to affect the situation. Her answer was to begin with a history of mental illness. “Too many people were in asylums and mental health professionals believed the community could be better served by addressing mental health issues in ways other than institutions,” she said. The Mental Health Act of 1988 eliminated asylums and set up behavioral health boards whose role was to identify types of mental health issues and provide the best treatment based on individual needs. The process of de-institutionalizing residents of asylums began, and now there are only three state mental health hospitals. While the act laid out a plan of addressing mental health issues, no one could have predicted the opiate problem that would complicate the issue of mental health, she said. There are individuals who have mental health issues and no opiate dependencies. Others have mental health issues and are addicted, and still others have mental health issues that may be caused by opiates. It can be difficult to differentiate, Harris added. Better medications and ways of dealing with mental health issues have given health professionals more effective ways to treat the disease, but the numbers keep rising. She cited statistics that state someone in Ohio is dying as a result of a drug overdose every six hours, and said this number may be low. Not all drug-related deaths are documented as testing is expensive. A lack of bed space in mental health institutions means more patients may turn to private care. For some, the care is not affordable, with daily hospitalization costs averaging $550 per day. With what is an epidemic of addiction in many communities, hospitals have pulled away from detoxing treatments and a recovery oriented system of care. “The problem of addiction has absorbed the time and attention of every aspect of the community,” Harris said. She went on to explain that Appalachian Ohio does not have a clean workforce and schools, industry and business in the region suffer as a result. The problem of addiction reaches all socio-economic levels. Harris believes a “front-end” approach is best for a long-term solution. She says that by taking the strength the people of Appalachia have to come together as a community, a network can be build that encourages children to see there is a future. Her goal is to construct such a network. While acknowledging that those already addicted still need community support, she believes starting with at-risk children in sixth grade is a positive step toward prevention. The plan would focus on asset development for each individual child and involve mentors who would build relationships and get involved through high school and beyond, she said. The mentors would show them what is good about living in Appalachia and how to take ownership for themselves and build hope in relationships. This proactive approach will be implemented in schools this September with the help of the Ohio Department of Education and Values Based Partners. Working with limited funding, the plan will involve volunteers who are willing to donate their time and resources.